Is Your Rig in Need of a Lift? As TRAA Certified and Wreckmaster professionals, we are ready to help you with our Heavy Duty Towing service get you out of that ditch or back into the shop. In fact, we have the only local 75-ton rotating wrecker in the region. Let us come to you and resolve your towing concerns right now. 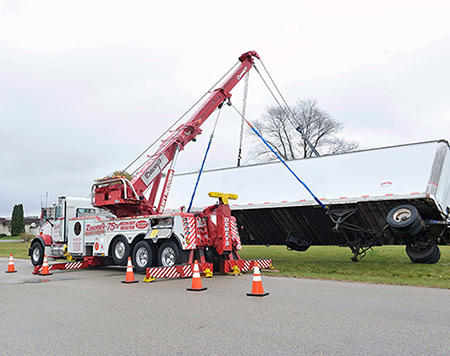 Call Dewey’s Service for complete heavy duty towing assistance when and where you need it. When your rig is stuck, call our licensed towing service. We operate a 24-hour emergency towing service to help you no matter where you are or when you need it. Our licensed and insured professionals are ready to help you! Get a FREE quote for towing by calling now.